I desperately needed the therapeutic, decompressing assistance of some art time yesterday so I made some time and cracked open the pages of my neglected art journal. I had not experimented with any of the items in my December Art Snacks box so I reached for that and decided to see what emerged on the page. As is so often the case, what I drew was a female figure. I gave her completely unrealistic anatomy as far as the arms are concerned (I have literally no idea why) and, thanks to the nature of the media in the box, I kept the figure monochromatic. The pop of colour came from a bold red, chunky paint pen. The nib was much larger than I am used to working with so attempting leaves was probably – definitely – a challenge too far. However, leaves aside, I am pleased with how the page turned out and am definitely pleased that I was able to benefit from some time at my art table. I was off work today while my kids were in school for the morning so, with some bonus free time, I grabbed the opportunity to do some art. I had not found time to play with the supplies in my November Art Snacks box so I got those and my art journal and set to work. 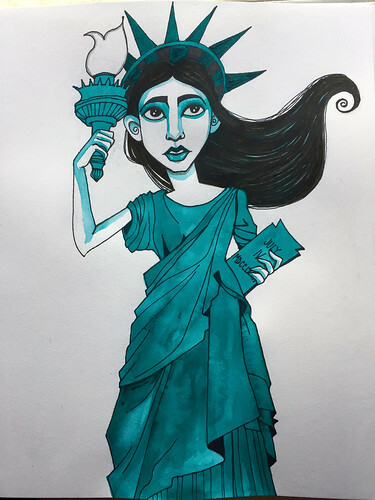 The Liquitex acrylic gouache I received was in a deep turquoise colour, one of my favourite colours, and I let that inform the subject matter as I thought the colour would suit an illustration of the Statue of Liberty. I didn’t want to try and draw the actual sculpture, however, so I drew my version of the iconic figure, changing her pose, hair, and face, but leaving enough elements for the subject to be obvious. I have not used gouache much generally and have never used acrylic gouache so this piece was a big experiment in media for me. I liked that I could use it thick on the crown but that diluted down it behaved a bit more like watercolour, which is how I used it on the body of the figure. I even managed to get some watercolour-like pigment blooms going. 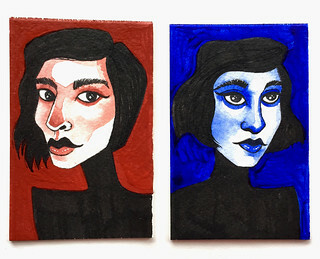 Gouache and I never got on well in the past, which is why I have barely used it, but I may have to give it another go. Mother’s Day was the excuse I needed to step away from the laundry, leave the vacuum unplugged, ignore the fact the basement playroom looks like it has been ransacked by raccoons, and instead spend some time at my art table. My monthly Art Snacks box had arrived the previous week so I thought I would have an experiment with the supplies within it and participate in the challenge to create some art using only those resources. Given I had a highlighter yellow paint pen and a bold orange chubby Pitt pen, the colour scheme shouted 1980s at me. I, therefore, knew I was going to end up creating an illustration with an ’80s vibe. 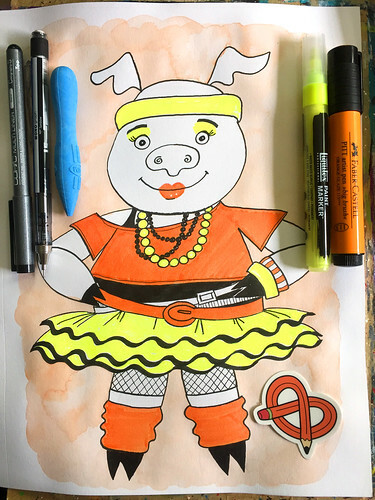 What emerged as I sketched was a pig sporting various 1980s fashions. I actually did not wear any of these types of clothes in the ’80s because a) I have never been fashionable b) I think I was still wearing 1970s hand-me-downs when neon and ra-ra skirts were in style and c) I was a non-conformist as a child. I did have a pair of legwarmers that I wore when roller skating so I guess I dipped my toes into this style, though my legwarmers were grey. But I digress. My pig looks confident and ready to throw some shapes on the dance floor. 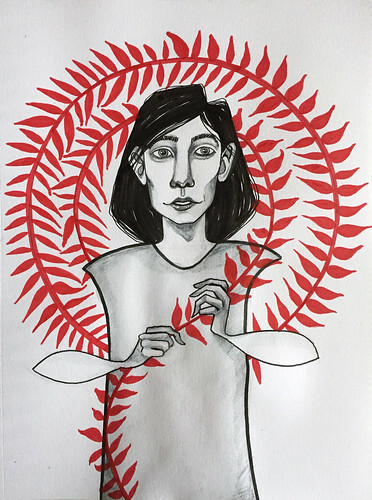 This week’s Life Book lesson was taken by Effy Wild and, since the end of the year is nigh, the lesson was essentially reflecting on what we have experienced in 2015, what things we wish to carry forward into 2016, and recording that in a visual way. The exemplar was on a theme of sunshine and roses and reminded me of a lovely piece of stained glass, specifically the panels in the doorways of houses from the 1930s. As lovely as the design was, it just wasn’t me. I, therefore, had to think about my version for a bit and wait for inspiration. When inspiration arrived, it was in the form of zombie bunnies. These wee characters have cropped up time and time again in my artwork over the years so it is probably apt that they should feature in a piece about reflection and development, about progress. 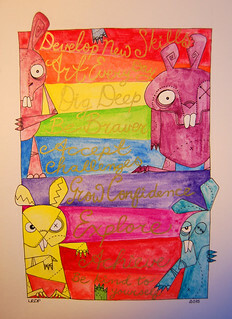 I used Inktense block and ink to create it. I wanted it to be vibrant and bright. I then wrote my intentions for the coming year – which arose from my reflection on the year about to end – in gold ink in each of the rainbow stripes. I kept my intentions broad for now. I will generate a list of goals closer to the end of the year. This week’s Life Book lesson was delivered by Danielle Donaldson. I had really enjoyed her previous lesson – Tiny Story Telling – so I was looking forward to further experimentation with watercolour illustration. The lesson demonstrated a different approach to watercolour hand lettering. The idea was for students to write our individual names and then surround that with illustrations of things that make us happy, bring us joy. However, I took my inspiration from a piece Donaldson showed in her tutorial, an illustrated list of art supplies. 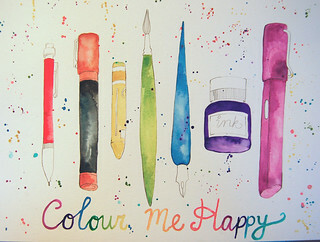 Since art makes me happy, makes me feel more balanced, and colour brightens my day, I thought the subject was apt. I sketched a variety of my art tools, painted them with blotchy watercolour, spattered, and added the text. I really like how the piece turned out.